For every company instance in SalesHood, there is a trending video feed panel showcasing different videos that users in the company have uploaded. This feed populates for every user’s home page. 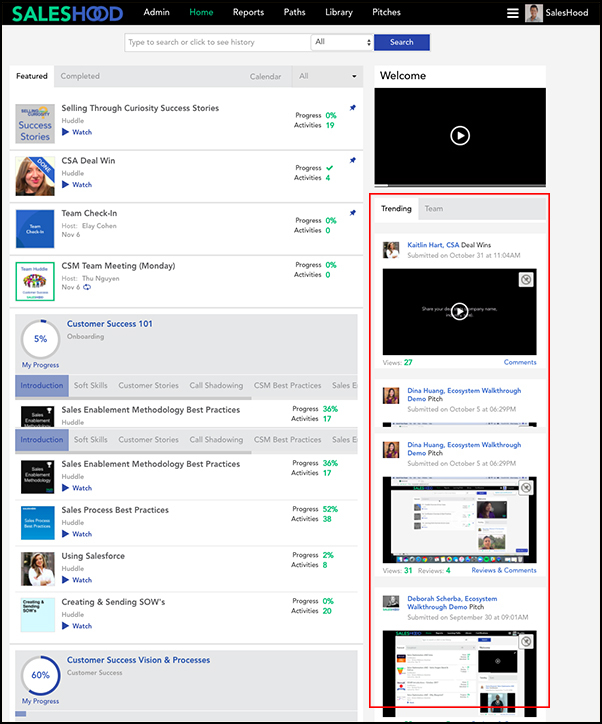 The trending feed is an interactive way for users to view the different Certification and Deal Win videos that have been uploaded throughout their organization. Users are able to scroll and view the activities that other teams in their company are involved in. *Previous behavior required Certification videos with a 70% rated score to appear on the home page video feed. The current behavior is any Certification video 0% and above will populate on the feed.